So I talked to Erna quite a bit about gender stuff, since she actually has worked in that area for some time and she has reflected pretty thoroughly on her own experiences and observations. For one thing, she finds that she does have to prove her technological expertise more often than male teachers, and when she observes the teachers she trains she sees the same thing. In a class on computer use, women teachers are still more likely to be asked “test” questions than men, which suggests that though men and women may use computers for daily tasks in the same ways, and may be aware that they use them in the same ways, when people talk or think about being “experienced with computers,” they tend to use a narrow definition that depends on actual programming or other creation, rather than just use, and that men are still perceived as being more competent. Also, Erna made a really good point in saying that she defined her own level of experience differently in different settings. Among her colleagues in Gender Studies, who are not so focused on tech, Erna describes herself as very experienced, but among people who program a lot, she describes herself as less so. So I think we need to look more closely at what standard people are using when asked to either describe their own practice or to evaluate others. She also made an interesting comment about relationships and careers; as I said in part 1 of the interview, she mentioned herself still feeling like she had to have serious reasons to use tech, not just enjoying the playful aspect and that this was part of an old, embedded gender stereotype. She also later said that it was easier for lesbians to escape that dynamic because between two women (and I assume his would hold for gay men) choosing to work or not did not instantly force you into some stance in relation to traditional roles. Oddly, in a completely different context, a gay friend of mine here in the US recently said the same. So that may be a real issue, but hard to get at since if self-reporting about tech use is unreliable, I would guess that self-reporting about partner’s attitudes or relationship issues connected to work with tech might be even less so! And I’d really prefer to avoid using tiny spy-cams. Erna in particular found that ICTs were important to her because she doesn’t like F2F communication so much. She claimed that she simply would not talk to people or stay as connected to them without email, chat applications, and Skype. This went really counter to the assumption most people seemed to make that connecting, speaking, or performing live was always better. Finally, continuing the theme of socializing, she felt that while New Media as a field was more cooperative than some, it was not very cohesive, compared to E-Learning, for example. What I start to notice is that the artists I speak with find it quite cooperative while the academics do not, which suggests again another case where people are using different baseline criteria. Really a great interview in the way it helps me to start seeing larger patterns and figuring out which questions I need to ask next. This entry was posted in book project, gender, new media and tagged Erna Kotkamp on 17 July, 2008 by Kim. My next interview was with Erna Kotkamp, who is at U. Utrecht where she has been doing work on gender studies, and more lately on technology. Erna described her use of technology in a way that, so far, more closely resembles the “classic geek mode” than any of the other people with whom I spoke. She said she was most comfortable with a screw-driver in hand, tinkering with a computer’s guts. At the same time, even she was not completely comfortable saying she just found it fun, admitting any frivolous reasons for her use of tech. And she noted herself that it was interesting to find such an old gender old still affecting her so much. Though Erna is not focusing explicitly on gender in her current research, which is on open-source software and e-learning, it was more explicitly part of this interview than in many, maybe because she notices that aspect in her work as a matter of course. She mentioned that 10 years ago, it was still common for people in humanities disciplines to feel comfortable ignoring tech or even announcing their ignorance of computers. At that time she was the “tech-y one” in Women’s Studies at U. Utrecht and was often called on to help others do things with computers, even to make PowerPoint slides. Now people are not so comfortable admitting techno-illiteracy, but Erna still feels some she knows need to be more savvy, and more importantly to recognize that knowing how to use tech and how to think critically about it are both essential basic skills now. Though Erna is the most inclined toward hardware hacking and of the women I’ve spoken with so far, one of the most proficient at coding, she seemed to get started sort of incidentally. Her family always was much more focused on arts and humanities kind of stuff, so neither she nor her brother were encouraged to do much with math, science, or tech. So though Erna feels her strengths lie in these later areas, she never really had much chance to develop them (or maybe even recognize them?) until by chance she took computer classes during her BA studies. Anyway, Erna had quite a few insights into her own use of technology, the open-source scene, and the impact of gender…but that will be in the next post because in fact i have to go do family stuff myself right now! 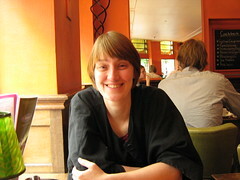 This entry was posted in book project, gender and tagged Erna Kotkamp on 15 July, 2008 by Kim.